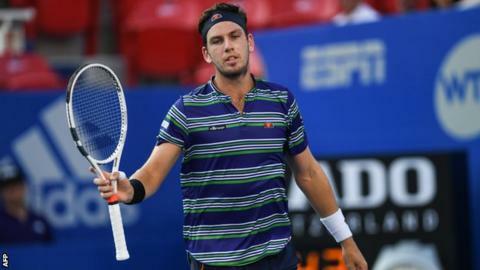 Cameron Norrie reached the semi-finals of the Mexican Open but fellow Briton Johanna Konta was knocked out. Norrie, the world number 64, beat American Mackenzie McDonald 6-3 6-2 to set up a meeting with German world number three Alexander Zverev. British number one Konta lost 6-3 7-5 to Croatian Donna Vekic in Acapulco. Australia's Nick Kyrgios reached the semi-finals with a 7-5 6-7 (3-7) 6-4 win over Swiss Stan Wawrinka in a match lasting two and a half hours. British number two Norrie, 23, said: "I was nervous. It was a big opportunity for both of us, but I played really solid today. "I've got nothing to lose tomorrow and all the pressure is on [Zverev]." Zverev, a 10-time ATP title winner, beat Australia's Alex de Minaur 6-4 6-4 in the quarter-finals. Australian Kyrgios followed up his last-16 win against world number two Rafael Nadal with victory over three-time Grand Slam champion Wawrinka. Kyrgios, who overcame food poisoning to beat Nadal, was later accused by the Spaniard of lacking respect "for the public, the rival and himself". The majority of the crowd supported Wawrinka, while Kyrgios slipped and cut a hand early on and ended the match with cramp. "I actually play better when the crowd is against me and giving me a bit of stink," said the 23-year-old, who will play John Isner or John Millman in the next round. "I'm extremely tired. I showed great resilience to come out and beat a player like Stan in some tough conditions. "I knew I was going to be the underdog and the crowd was going to be in [his] favour, but I served great today." In the women's draw, American Sofia Kenin beat former world number one Victoria Azarenka of Belarus 6-4 4-6 7-5. Meanwhile, British number one Kyle Edmund reached the quarter-finals of the Oracle Challenger Series at Indian Wells by beating Czech Lukas Rosol 6-3 6-4. Dan Evans also progressed with a 6-1 6-2 win over Colombia's Santiago Giraldo.